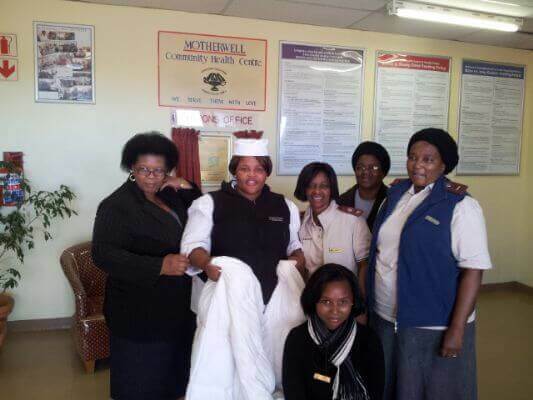 Part of Shamwari Group, Shamwari Game Reserve, the malaria free Big 5 game reserve situated in the Eastern Cape, donated linen to the Motherwell Community Health Centre in Port Elizabeth and the Mary Coetzee Children’s Home in Somerset East this July. Seeing a dire need for bedding at both local charities, towels, duvet inners and other soft linens were donated by the reserve. Pictured below are from left: Shamwari spa therapists Crystal Reid and Mariska Muller with social worker Denise Hope and the children and staff of Mary Coetzee Children’s Home. Chef Dinah donated the linen at the Motherwell Community Health Centre on behalf of Shamwari Game Reserve after she informed the reserve that the centre would benefit greatly from such a contribution.